Custom-built by Gus Pounds to exacting standards in Oak Grove Elem School district. 10'ceiling main floor.Birch 5" plank floors on main and 2nd floor.Wide open floor plan with abundant light.Kitchen features quartz counters, premium stainless steel appliances:Thermador gas cooktop, double convection ovens.Coffered ceiling in oversized family room with fireplace. 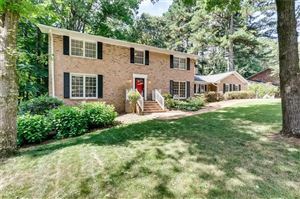 3-car garage.Swimming pool and hot tub in level-fenced backyard, heated roll-up garage bay perfect for bar or man cave-just add some TVs and beer taps.Gas line for future firepit.Convenient to Emory,CDC.CHOA. Data last updated: 4/21/19 4:10 PM PDT.